J.D. Power has released their 2017 Canadian Wireless Customer Care Study, which has crowned Bell’s Virgin Mobile as the top wireless carrier when it comes to customer care satisfaction, with Telus-owned Koodo Mobile closely behind in second, followed by Videotron, making up the top three. 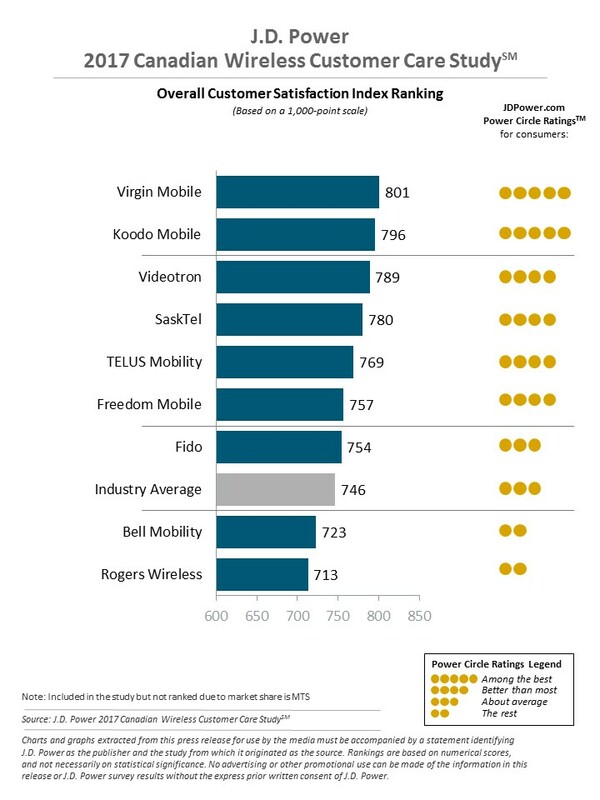 As you can see below, Virgin Mobile and Koodo Mobile are the only two rated ‘Among the best’, while Videotron, SaskTel, TELUS and Freedom Mobile are rated as ‘Better than most’. Rogers-owned Fido is ‘About average’ with a rating slightly above the industry average, while Bell and Rogers take the worst rankings, rounding out the bottom of the list. J.D. Power says Virgin ranked well with their customer service representatives and online service. The study concluded 40% of customers say “good customer service” and “price” tie as the top reasons for choosing their carrier, with “offered good service plan options” as a second commonly cited reason. Compared to last year, the 2017 study saw overall wireless customer care satisfaction jump only 8 points from 738 to 746. Clearly, our wireless carriers can do better. The study was from Sept-Oct 2016 and March 2017, based on an online survey from over 5,500 wireless customers who had contacted customer service. What wireless carrier do you think offers the best ‘customer care satisfaction’ in Canada? Do you agree with the results of the survey?